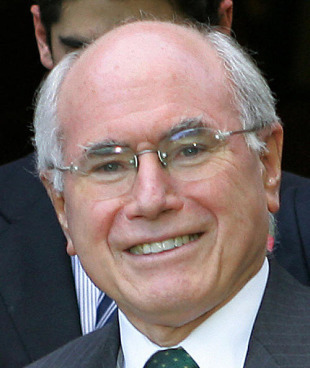 The nomination of John Howard, the former Australian Prime Minister, for the ICC's vice-presidency has taken another hit with Sri Lanka saying it would not support his candidature. As first reported by Cricinfo, South Africa and Zimbabwe are leading a move to prevent Howard from being nominated to a post from where he will, in two years' time, graduate to heading the ICC. Howard is the nominee of Australia and New Zealand and, under the ICC's region-based nomination system, his entry into the ICC would normally have been a formality. However, the signs of trouble have been evident since the last ICC meeting in Dubai about two months ago where, Cricinfo understands, South Africa and Sri Lanka voiced their opposition to his nomination. Howard needs seven votes from the ten Test-playing countries to be accepted and, with three countries already opposing him, one more negative vote would rule him out. Sri Lanka Cricket's interim committee chairman Somachandra de Silva told Cricinfo that on principle his board would not support Howard's candidature because he lacks a cricketing background. "On principle it is the wrong thing to do to bring someone from outside for the vice-presidency," de Silva said. "We would support any of the directors from Australia and New Zealand who are representatives of the ICC, but not anyone from outside. "At the last ICC meeting in Dubai about two months ago, it was mentioned that Howard's name was being put forward for the vice-president's post, and I was of the opinion that it was wrong. Anyone coming forward for ICC posts should be currently involved in cricket and not be a total outsider. In that respect we would not be supporting the candidature of Howard for the vice-presidency," de Silva said. As prime minister, Howard had, in 2004, attracted heavy criticism in Sri Lanka when he questioned the bowling action of Muttiah Muralitharan. He made the comments twice, once at a function organized by his Liberal Party, and then, several days later, on a radio programme when he was questioned on his statement. The comments came before Sri Lanka were scheduled to tour Australia - a Test series that Murali eventually skipped. When news of the nomination became public last March, Murali said he had forgiven Howard for his comments but added that, should his nomination succeed, he would have to convince the sub-continent of his intentions.